A beautifully bursted tone machine from master craftsman, Michael Tuttle! Payments as low as $88/mo. Or, apply & pay as little as $88/mo. Single Coil Heaven with a lightly flamed Maple Neck !!! 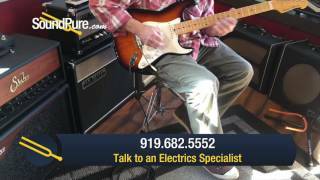 In this video, Sound Pure electrics specialist Eddie Berman tries out a single-coil Michael Tuttle Custom Classic S 2-Tone Burst SSS. 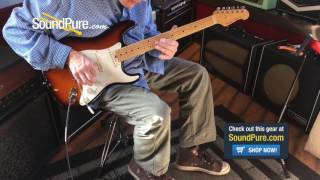 In this video, Sound Pure electric guitar specialist Eddie Berman tests out the Michael Tuttle Custom Classic S 2-Tone Burst SSS #417 with a Suhr Bella Reverb Head, a Suhr Bella 1x12 Cabinet, a Strymon El Capistan dTape Delay Effect Pedal and a Klon KTR Overdrive Pedal. 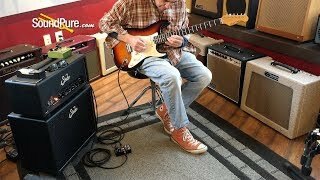 In this video Sound Pure electric guitar specialist Eddie Berman tests out the Michael Tuttle Custom Classic S 2-Tone Burst HSS #418 with a Caroline Guitar Company Shigeharu IC Fuzz/Octave Pedal, a Strymon El Capistan - dTape Delay Effect Pedal, a Suhr Bella Reverb Head and a Suhr Bella 1x12 Cabinet. Neck Back Shapes: .830-C, 12"